​​Excerpts from reviews from around the globe on Myrath's latest album Legacy. 1340 Magazine: Myrath is fundamentally a progressive metal/hard rock band. Their music is exceptionally complex, nuanced, and orchestrated to a supreme level of musicianship. One simply cannot talk about a prog rock band without making the obligatory Dream Theater reference. Yes, there are similarities. But what makes Myrath so very special is the added depth and exotic flair which owes itself to their Arabic origins. You’ll hear quite a bit of ‘traditional’ sounding metal, such that Kamelot or the aforementioned Dream Theater are known for, but Myrath really shines when they incorporate their own traditional music in their sound. How can I describe it? Someone who knows music theory could tell you specifically, but all I can say is that it sounds quite “Middle Eastern” in regards to instrumentation and the exceptional vocal stylings of Zaher Zorgati. The members of Myrath are exceptional musicians who have created what is easily one of the best albums I’ve heard in a long time; Legacy is a refreshing change of style from a relatively underrepresented part of the global music scene. Sputnik Music: Pitching Myrath to the uninitiated listener is like describing a foreigner's accent without referencing their country of origin. If you will, imagine a modern-day Amorphis born and forged by deserts and tribes, as opposed to skies and lakes. Initial releases (Hope and Desert Call) laid a progressive establishment, showcasing a rare blend of Tunisian heritage and musical prowess. This amalgamation, otherwise known as oriental metal, is more commonly associated with Israel's Orphaned Land. Yet Myrath are no Orphaned Land. By comparison, Myrath are concise, straightforward and accessible. Such facets are just as apparent when you objectively consider their 2011 release, Tales of the Sands. Tight and superbly produced, Myrath's third album was arguably their best case for inviting listeners to hear something that could best be described as an oriental appetizer. Five years later they're continuing that case, only this time the developments are of a more subtle nature. Sea of Tranquility: Myrath made such a strong impression with their first three albums Hope, Desert Call and Tales Of The Sand. So I couldn't possibly pass up the opportunity to taste their wonderful blend of what has been labeled as "Oriental Metal" once again. Few band's songs move me in the way that Myrath's do, and listening to their new album Legacy is another memorable and uplifting experience. It's little wonder that I'm so drawn to the music of this band, being a massive fan of progressive metal with Symphony X and the like and I also really enjoy middle eastern music so when you mix the two styles it's like the perfect match. Whilst others have combined metal and that middle eastern sound so successfully in the past such as guitarist Marty Friedman and of course the groups like Orphaned Land, Myrath's range of influences has certainly resulted in quite the distinctive style that sets them apart. Legacy is an early contender for metal album of the year, so get your per-orders in quick as metal releases this impressive don't come along every day. ​Hard Rock Haven: Legacy is a very different album from its predecessor, and may take a few spins to really sink in. When it does though, you’ll find yourself humming these melodies hours later. It’s also an album that has the potential to expand’s Myrath’s fanbase beyond the Kamelot/Circus Maximus Prog/Power scene and into Folk Metal and even Melodic Rock territory. And when a band is as talented as Myrath is, the more people to discover them the better. Bloody Good Music : They also manage to do something that very little metal can anymore; be uplifting. There's a sense of optimism to the melodies running through these songs that drips of positivity, that makes the songs engaging and fun. Metal is so dark so often that it's refreshing to hear a record that doesn't mind letting in some light. "Legacy" is an album that's hard to accurately describe. There's something about their blend of foreign elements with traditional melodic prog metal that doesn't fit neatly into our lexicon, leaving my with little to say but that this is an album that you owe it to yourself to at least check out. Myrath is making hugely melodic music that truly does something different, and that deserves respect. The fact that they pull it off this well deserves applause. "Legacy" is a great record, and along with the releases I've already reviewed from Sunburst and Redemption, have already made this a banner year for progressive-leaning metal. The Metal Pigeon: Tunisia’s greatest (and perhaps only) metal export Myrath return with their first new album in five years with Legacy, one of my most anticipated albums of the year. I was sold on this band with 2011’s Tales of the Sands, an album that was largely spectacular, the sound of a band that had found their distinctive style and the songwriting chops to match. Well, five years is an eternity in metal, and Myrath seem to have spent the time wisely because Legacy is a truly inspired breath of fresh air that is pushing the boundaries of what oriental metal can sound like. Metal Nation News: The album’s sound is perfect, the oriental parts are enough to give Myrath’s music an identity of its own but never becomes “too much” and just when you start to feel like the oriental melody should end, it does. Malek Ben Arbia’s guitar licks resemble Michael Romeo’s riffs with a taste of Myrath’s own flavor and just when the progressive side of things begin to turn into mathematical problems, it ends, keeping the disc in perfect balance. Songs are neither cheesy, nor complex to the level of “wtf did I just listen to” nonsense. There are tracks like Believer, your perfect “warm up, pop-ish” songs. “In your face metal” track Get Your Freedom Back with that “familiar” Symphony X feeling makes you headbang and tracks like I Want to Die finds you, leaves you dry in the desert and watches you being mesmerized by endless mirages with their oriental, traditional folk structure. Zaher Zorgati’s vocal performance is top-notch. He knows his range, his powers, his weaknesses and works on them like a charm. His vocal approach reminds me of Roy Khan from Kamelot. If you are into power-progressive metal a la Symphony X, if you are looking for that “desert sound” and oriental stuff attracts you, then Legacy is probably the best album of 2016 for you. A truly beautiful album. Audio Inferno: Another thing is almost every song feels so soothing. The vocal delivery made sure of that. If there’s one thing you can’t fault Myrath on, it’s their vocal delivery. It’s so beautifully done. The guys on the instruments are also far from slouches. The guitar solo/folk instrument harmonies on the album are a thing of beauty. The drumming is well done and manages to blend seamlessly with everything else. This album is the embodiment of precession in merging multiple layers of music. But please, do give this album a listen. It’s really well done and deserves to be heard. Cheers to Myrath for the slight change in sound and still coming out with something this good. Markus Heavy Metal Blog : Myrath is a very interesting band for many reasons. First of all, Myrath comes from Tunesia, a country that is known for many thing, but surely not for metal music. Second of all it's the music itself that is quite fascinating. Myath is one of these bands I haven't heard about up till now. "Legacy" is their first album that made it into my player and it was a very positive experience listening to these guys. The Metalist: It’s clear Myrath have a complete love of their music. Over the course of the previous two albums have made valiant attempts to fuse everything they love into something that they can truly call their own. With ‘Legacy‘, there is absolutely no question that they have accomplished that. It’s an album worth investing in – it’s the complete package of pristine progressive musicianship. For someone who really loves this kind of effort like myself, it’s hard to see how any album will top this in 2016. Metal Reviews: I am not always subscribing to the theory that one has to produce odd time signatures and finger twisting leads to be called progressive. On Legacy Myrath uphold the genre with clean uncluttered lines, obvious power, conviction and overall forward outlook. I know the year is just beginning, but Legacy is going to compete for my album of the year on the power progressive/symphonic end of spectrum, and is very likely to win. Who is Sam Lewis Review: Overall though, Legacy is easily Myrath's best work yet. The band have really come into their own here, and this is the consummation of everything the band have experimented with on their past three albums. I hope this album will reach many new fans, as they deserve much greater recognition. Metal Rules: The more progressive elements are laced beautifully through the diverse and multi-faceted album. The vocal harmonies and layers add a huge, epic almost soundtrack quality to some of the songs such as, ‘I Want To Die’. This album sounds massive in every respect. Following the legacy of Myrath there have been a few Power Metal bands crawling out of the desert around Tunisia and they will have a hard time following the leaders who now a decade into their career have four simply superb albums in a row. We Love Metal: I enjoy being exposed to things I don’t normally experience in my middle American day to day. Myrath is the epitome of incorporating their Middle Eastern background into Metal and I love them all that much more for it. So to those who think that it’s wrong get over it and join the modern world. On Legacy (which is actually the translation for Myrath), the band once again makes a statement in the strongest of terms that they should absolutely be considered to be one of the top bands of today in the Prog-Power realm of Metal. After an instrumental intro track (Jasmin) that builds quite nicely and might make you think you are in Tunis, Myrath launches into a contender for best song of 2016 (non-cookie monster vocals) with Believer. This one gives me chills every time I hear it. There is just something about the blend of traditional Middle Eastern music with Metal that works perfectly for me. Ultimate Metal : Myrath have taken themselves up ten notches and some. They seem to have attended the university of Kamelot and emerged as a band that is on a whole new level, both visually and musically. They have refined the melodic side of their sound while retaining all the special qualities that have garnered them an ever increasing fan following to date. While I have always appreciated their music (especially the Symphony X comparisons), there always seemed to be something missing in their music for me personally. ​Loud Park Video courtesy of Loud Park Management in Japan. Angry Metal Guy :Myrath also drives into film score territory with remarkable alacrity. The intro to “Through Your Eyes” could be the soundtrack to a Hollywood blockbuster (likely involving mummies and rampant orientalism), while “The Unburnt” sees them shooting for the heavier side of their sound with the opening riff, but rock an artful, orchestral bridge here. And throughout the album the band knocks out interesting musical moments; technical, but poppy, walking the fine line that is so hard to navigate. Reminiscent of Angra‘s Secret Garden the songwriting here is remarkably strong. Despite being poppy, it doesn’t lose its swagger with repeated listens. Legacy never feels like a sugar high. Rather, it’s the kind of album that the band just simply crafted to perfection. Each song is razor sharp and immediate, but surprisingly deep. 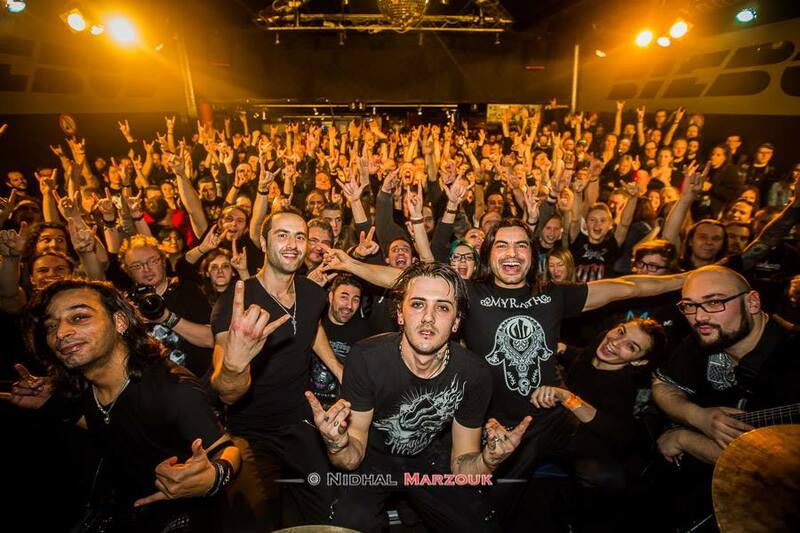 Hard Rock Haven: After unleashing their epic masterpiece Tales of the Sands in 2011, Tunisian Progressive/Power Metal band Myrath made fans wait nearly five long years for a follow-up. Myrath’s new album, their fourth overall, is titled Legacy, and needless to say expectations are quite high. Legacy is a very different album from its predecessor, and may take a few spins to really sink in. When it does though, you’ll find yourself humming these melodies hours later. It’s also an album that has the potential to expand’s Myrath’s fanbase beyond the Kamelot/Circus Maximus Prog/Power scene and into Folk Metal and even Melodic Rock territory. And when a band is as talented as Myrath is, the more people to discover them the better. Black Wind Metal: A promising element is the way in which the band uses piano and keyboard sounds to its advantage throughout the entire album. The epic and peaceful ”Through Your Eyes” becomes truly magical when its fragile and harmonious piano sounds take the lead. The confidently vintage piano sound in ”Endure the Silence” serves as an unusual, yet fitting, overture and coda that immediately grabs the attention of the audience. The more progressive ”Duat” rather features floating keyboard patterns that recall space metal projects like Ayreon or Star One. Traditional-sounding folk elements and futuristic sound patterns fuse perfectly on this album highlight. Another track that sound like a traditional Arabic folk tune-gone-contemporary-rock-song is the great bonus track ”Other Side”. Make sure to purchase the digipak version with this track that ends the album on a high note and summarizes very well what Myrath sounds like these days. A final standout song is ”I Want to Die”, which is clearly the record’s most epic track. The Maghreb symphonic elements and soothing vocals are so dominant yet elegant that this could easily be the title track of a future James Bond movie. Legacy is a solid candidate for the top spots of the rock and metal music lists of this year’s best records. Join the Maghreb metal revolution. Prog Power USA's Glen Harveston: Names Legacy #3 out of 50 of top release 50 Metal Albums for 2016 : This one hit me right in the Prog/Power gonads. I must have watched the video for “Believer” 20 times straight when it first hit. It didn’t end there as they delivered one great song after another (“all killer, no filler”). I’m manly enough to admit that I practiced my white boy belly dancing moves more than once while spinning this.